No, this isn’t the Toyota Corolla hot hatch you were hoping for. Toyota has already announced it intends to build performance versions of virtually every model in its line-up, so it makes sense for one of its most popular models, the Corolla Hatchback, to get the GR Sport treatment. If you need a refresher, GR Sport is the entry-level tier of Toyota’s new Gazoo Racing range, which also includes mid-level GR and range-topping GRMN models. In the US, the 2020 Supra will be the first GR-branded Toyota, and the Yaris GR Sport has already been revealed for Europe. Sadly, being a base model means the Corolla GR Sport isn’t the hot hatch we were hoping for, as it doesn’t offer any performance advantages over the standard model. Instead, any changes are purely cosmetic to give the hatchback a sportier look. That doesn't mean there won't be a proper Corolla hot hatchback, however, as Toyota's chief designer recently confirmed a full-fat GRMN version is coming soon. Available with a choice of 1.8 or 2.0-liter hybrid powertrains, the Toyota Corolla GR Sport gets a new front grille with a dark chrome finish, lower skirts and sills and a rear diffuser. It also rides on exclusive 18-inch machined-finish alloy wheels, and includes rear privacy glass, front fog lights, LED headlights and an exclusive Dynamic Grey bi-tone paint finish. Inside, the cabin features sports seats in black cloth upholstery with leather-effect bolsters, but full leather upholstery can be specified as an option. Black and red stitching adds a striking contrast on the instrument panel, steering wheel and shift lever. After its debut at the 2019 Geneva Motor Show, the Toyota Corolla GR Sport will go on sale in Europe in January 2020. No word on US availability yet, but it could be sold as a rebranded TRD model over here. Also at the Geneva Motor Show, Toyota will showcase the Corolla Trek wagon, which was designed in collaboration between Toyota and Trek Bicycles. 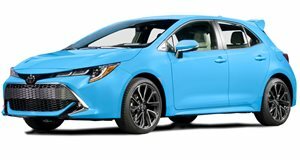 Also offered with 1.8 or 2.0-liter hybrid powertrains, the Corolla Trek benefits from a 0.7-inch increase in ride height and features front and rear underruns, 17-inch machined alloy wheels, rear privacy glass, front fog lights and LED headlights. Inside, there is a seven-inch TFT infotainment screen, two-tone cloth upholstery and matching wood trim details. Sales will kick off in Europe in August 2019.